Thanks for contacting us. There is 70 year long history behind this, and we are happy to bring you up to date on the matter. We have attached various communications we have exchanged with various parties on this matter. Is there a time we could meet face to face to discuss this? We really do need to begin work very quickly to repair the damaged structure, as its continuing failure threatens to eliminate any access to your client's property, as well as to 30 other homes, each valued at multiple millions of dollars. 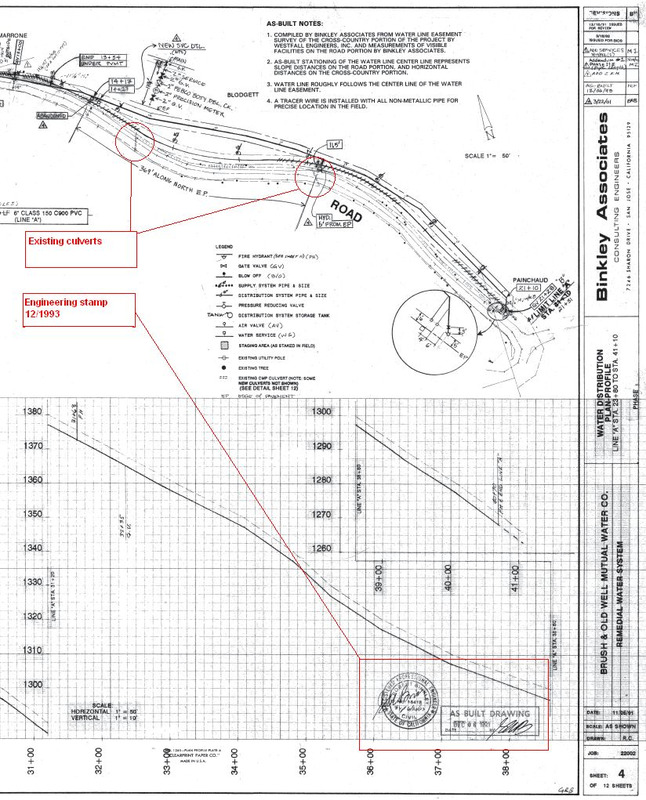 Even more significantly, such a failure, as it is directly uphill from California State Highway 17, has the potential (as the State points out in the attached letter) to block State Highway 17, which would place your client in a very bad position, arguably violating several parts of the California State Highway Code). As you can see from the enclosed correspondence, we (your client, the residents of Brush & Ridge Roads, and the State Department of Transportation) all assumed for the past 7 decades that the drainage structure was built and owned by the California Department of Transportation. Instead it is owned by your client. While the Brush Road Corporation could take the position that it is the duty of your client to eliminate this immediate potential risk to the integrity of Brush Road, and further to State Highway 17; we instead have taken the view that there is a mutual interest among the parcel owners in repairing this structure, and further in performing the essential maintenance of the structure for the next 70 years, and for the rest of time. With a similar enlightenment, the various parcel owners formed the Brush Road Corporation in 1988 to pool their collective interests in maintaining the private roads known as Brush and Old Well Roads, rather than depending on the good will of each current property owner in maintaining the portions of these roads that cross their property. Your client is a member of this corporation by virtue of his ownership of the parcel upon which this structure exists. 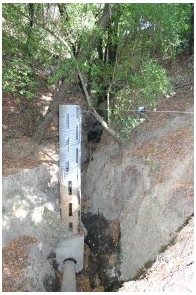 There is a continuing need for maintenance of the drainage structure, as if this is not done, the annual storm water flow (in the Santa Cruz Mountains we get 40 inches or more of rain each winter, and some years as much as 60 inches; and sometimes more than 10 inches in a 24 hour period) will rapidly build up behind uncleared brush and leaves, and quickly flood Brush Road, and overflow to block the state highway. Over the past 70 years, Caltrans maintenance people have prevented this occurrence by paying prompt, proactive attention to the structure and performing the necessary cleanups. The Brush Road Corporation assessed its membership $1,500 from each affected parcel owner in order to get this fixed. Your client is the only member of the corporation who has not yet contributed. Originally our thought was to use this money to force the State to fix their structure. Once we learned that the structure is owned by your client, our view shifted to set up a joint responsibility for repairing and maintaining the structure between the various owners of parcels on Brush, Old Well and Ridge roads. To this end we discussed with your client his granting of a water drainage easement to the BRC over this land so that it could implement the collective responsibility to build and maintain a replacement drainage structure, just as it has and has executed the responsibility to build and maintain the Brush and Old Well Roads these past twenty years.